If you know of others, please let me know at . River Phoenix: A Short Life by Brian J. Robb. Published by Plexus in 1995. The first book to be published about River following his death. Plenty of good colour and mono pix. The River Phoenix Album by Penelope Dening. Published by Plexus. A large format picture book with a concise and illuminating appraisal of River's life and work. River Phoenix : Hero and Heartthrob by Grace Catalano. Published 1986 by Bantam, now out of print. In Search for River Phoenix by Barry C. Lawrence. Barry Lawrence traveled in the steps of River Phoenix to retrace as much of his life as possible in his book. Lost In Hollywood: The Fast Times and Short Life of River Phoenix by John Glatt. Published by Donald I. Fine (US) in 1995. Also published in UK by Piatkus under the title River Phoenix : The Biography. The first major biography, a little lightweight in places but well worth a read. A rather poor selection of pictures though, at least in the UK version. River Phoenix by Penny Stempel. One in a series entitled "They Died Too Young" published by Parragon. A neat little pocket sized book, available as far as I know only through Woolworth stores in the UK. It can be ordered to WATTERSTONE'S book store, tel.0171-581-8522. There's been a re-release of this biography "River Phoenix : They Died Too Young" in a more usual format, and library binding. It's published by Chelsea House Pub in January 2000. Running on Empty by John Barker. Child Stars, Vol. 9: River Phoenix by Dana Rasmussen (credited as Dana Rasmusse). Dana Rasmussen wrote a series of books about child stars, including this one. The River Phoenix Handbook - Everything you need to know about River Phoenix by Emily Smith . 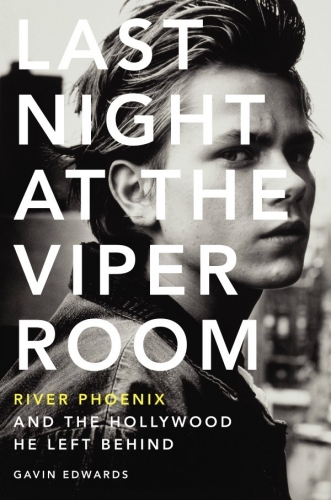 Last night at the Viper Room - River Phoenix and the Hollywood he left behind by Gavin Edwards. "This Road Will Never End" : this documentary film about River was shown by Channel 4 Television in the UK on September 8th 1996. More information and review here. E! True Hollywood Story : The E! Entertainment Channel in US dedicated one of its THS documentaries to River. Rather tasteless in general, but not as much as feared, retrospectively, and featuring a couple of rare documents. Eclipsed by Death: The Life of River Phoenix : this River Phoenix documentary was done by Mr John Griffin for the Celebrity Channel. It aired in US on March 12 and 13, 2002, on the Arts & Entertainment channel. US residents can buy the show on tape on the Biography site here (unfortunately, shipment is not allowed outside US so far). Unlike the E! one, this documentary was not the result of a commission, but was initiated by Mr Griffin to present a more complete image of River that was usually showed. It features interviews of people who worked with River, rare footage. The Last 24 : (also known as "The Final 24") one episode of the a documentary series produced by Discovery Channel was about the last day of River. Both movies are shown at the Gagosian gallery in Beverly Hills from February 19, 2011 to April 9, 2011, in an exhibition called Unfinished, along with a series of watercolours by Van Sant reminiscing of the movie characters. Too Young to Die : River Phoenix (2013) : German documentary film production company Broadview TV has completed in 2013 a 52' documentary about River in their ongoing series "Too Young To Die". For French and German viewers, it aired on Arte on August 9th, 2014 in the Summer of the 90es program. Attention Australian fans : it will air on Australian TV (Foxtel) on March 12, 2014. American Fame Pt. 1: Drowning River Phoenix. French director Kevin Robic shot a short movie dedicated to River Phoenix, inspired by his life, and simply called "River Phoenix" : Watch the movie here on DailyMotion (official). Kevin Robic also uploaded a filmed making of of this short movie. Interview of Kevin Robic for the River Phoenix Pages.